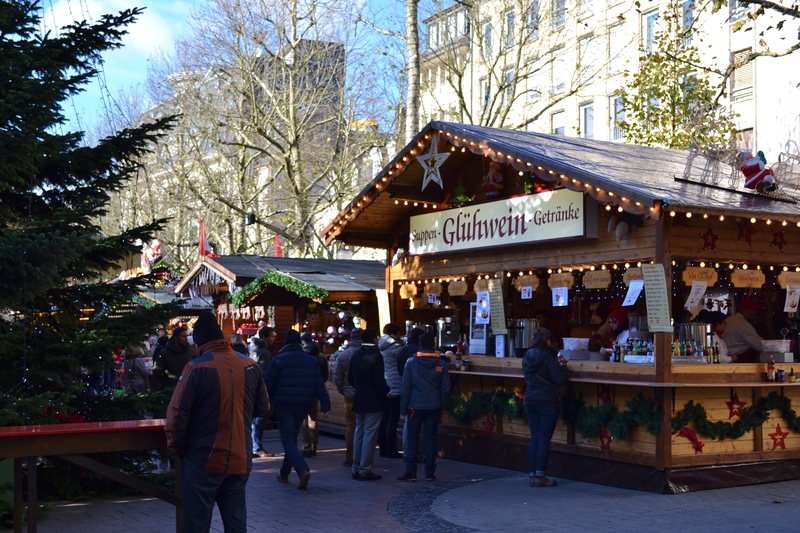 Now that we are knee deep in December, Christmas Markets are in full swing. So far, I’ve cruised through four of them. Here are some photos and observations. 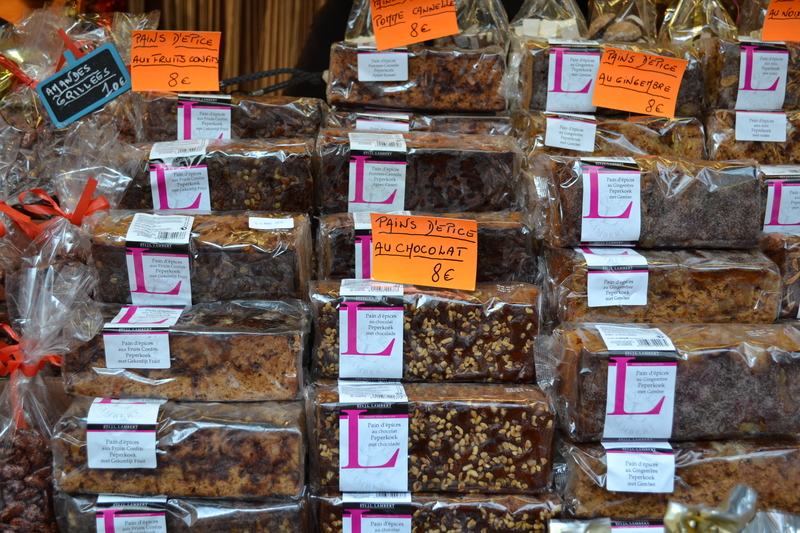 Our first market of the season was Bernkastel-Kues, on the Mosel River, which I wrote about in my “And the Season Begins” post. It’s one of my favorite small German towns, and the market is equally fabulous. Being there in the evening, or just as dusk falls, is the best–the markets (all of them, as far as I’ve seen) really become magical when the lights are twinkling at dark, or in a hazy swirl of snow. 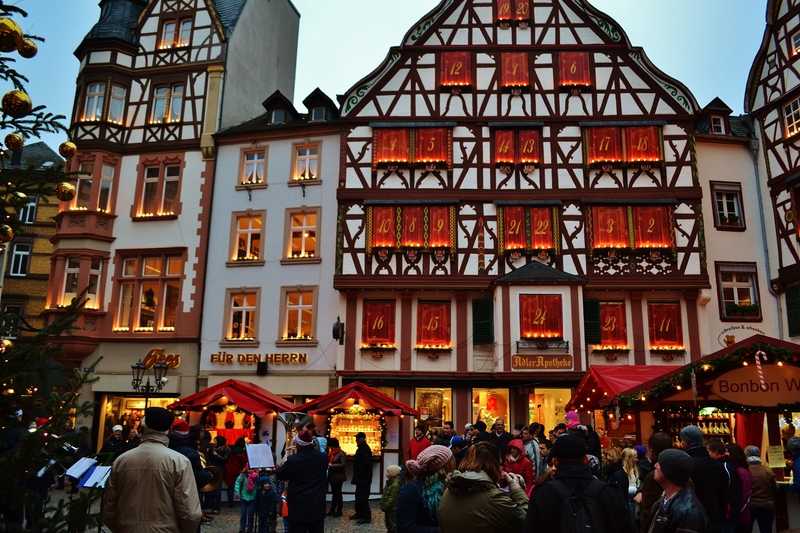 Plus, Bernkastel has an old world feel that’s undiluted here, but often more watered down in larger cities (where busy, modern shopping areas stand side by side with older architecture). 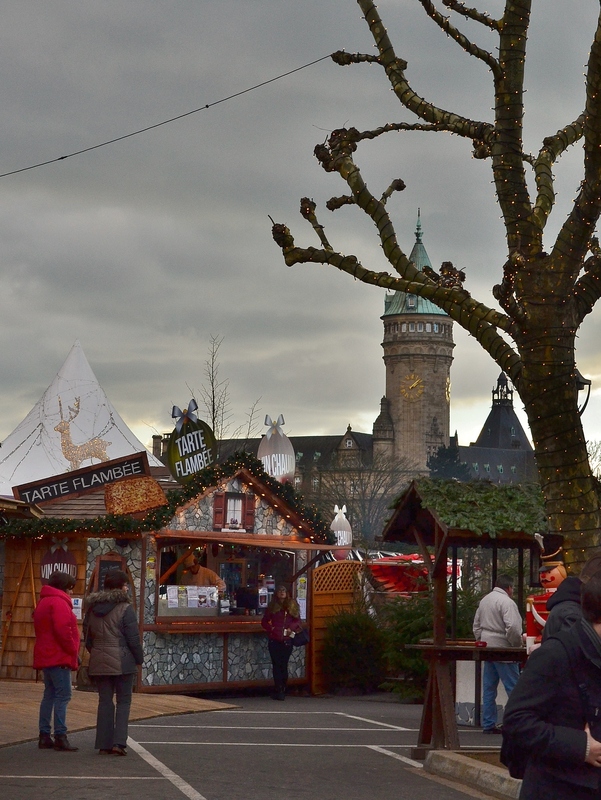 My next adventure in Gluhwein and Gingerbread was in Luxembourg City, the week of Thanksgiving. It was a sleepy Monday, and the market was just beginning to wake up for the season. The day was bitter cold, so the hot gluhwein and potato pancakes there were greedily gobbled out of both desire and necessity. And after a glass of gluhwein, I wandered into a store with a friend and bought a big fuzzy mohair sweater. Later that night, I wondered if that was a wine-induced mistake: I look a little like giant grey blueberry (greyberry?) in it. . . but I’ve worn it a lot since then. Turns out that, ridiculous as it looks, it is very warm and cozy on a winter day, and sometimes that’s not a bad trade off for looking like a Fruit of the Loom character. It also hides any extra pounds you might accumulate walking around markets eating potato pancakes and gingerbread. 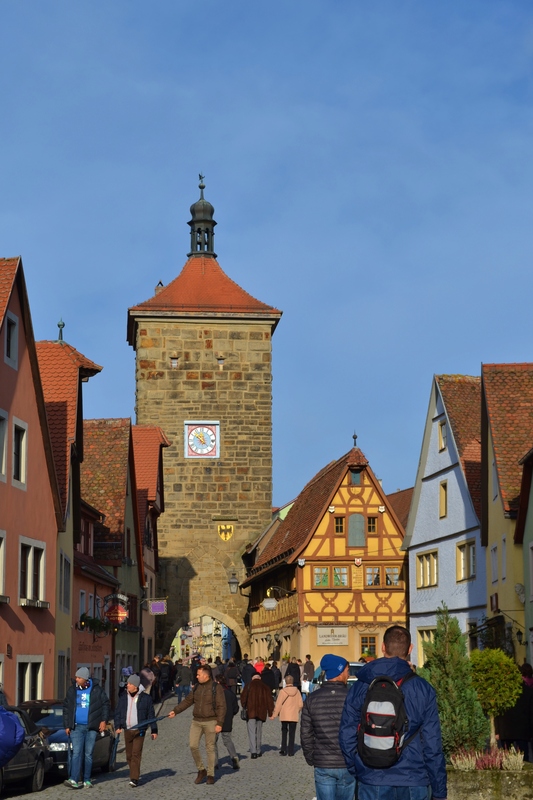 glimpse of Rothenburg– a charming, walled, 13th century town in Bavaria. 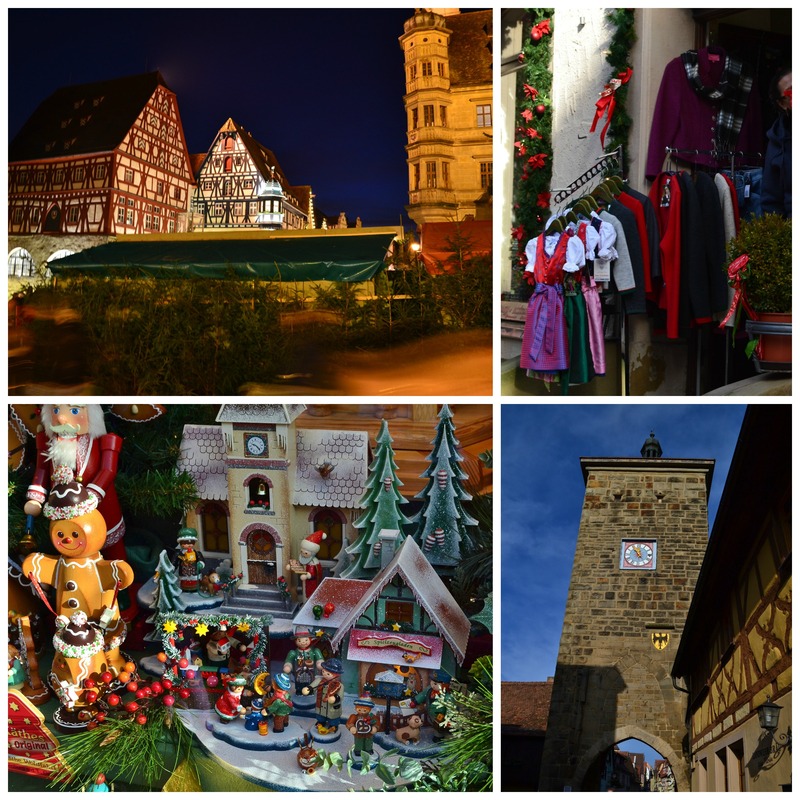 Any time of year that you visit Rothenburg, you will feel that you’ve stumbled on to Christmastown. It is quaint and visually perfect, and peppered with small stores selling Christmas decorations. It’s also famous for Schneeballs (“snowballs”) –a fried doughball covered in (most often) chocolate, cinnamon sugar, or powdered sugar. They can be delicious, but on our first trip to Rothenburg a schneeball single-handedly took down my husband for an entire evening. fairly hard to understand. Some of her phrases just didn’t translate. No worries, though–a stroll through Rothenburg ob der Tauber is never a mistake. The view from each corner is fantastic. And trip number four? Metz, France. Metz market has an ice skating rink which our kids enjoyed last year. This year, it has added an ice sculpture exhibit (Disney themed). The market is actually multiple markets in different squares around the city, but we lingered longest near Place St. Louis–home to stalls with table linens, butter biscuits, and outrageously good candied fruits. 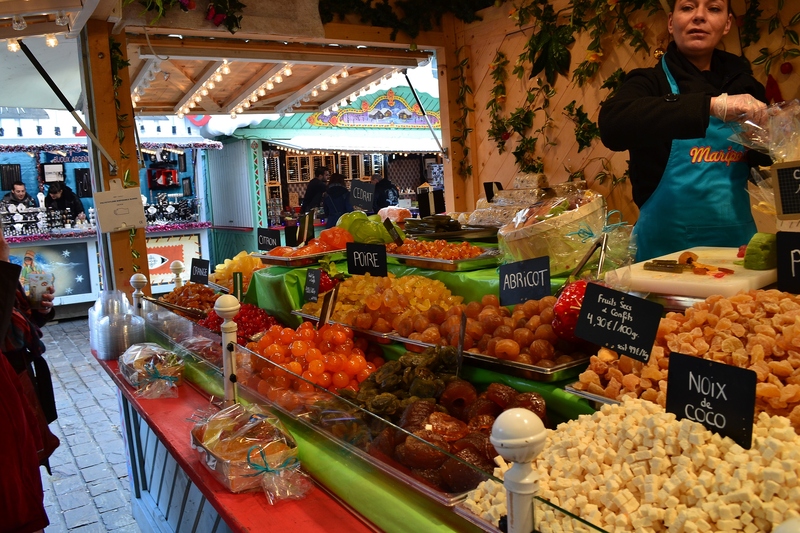 Candied fruits are rarely featured in the German markets, so they were a special treat! Place St. Louis was also home to one of the most beautiful carousels I have ever seen. 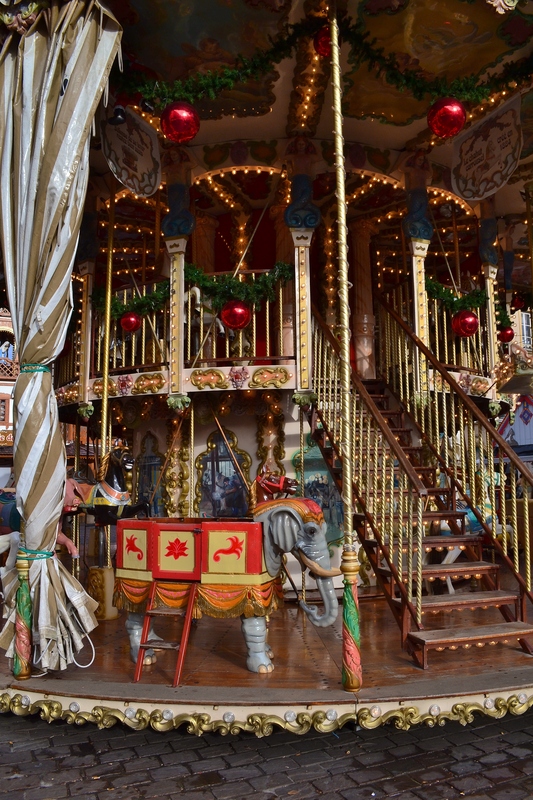 (We’ve noticed vintage carousels in so many French cities–always a delight for the eyes. One of my favorite photos of my kids around age 4-6 is on a carousel in St. Malo, France.) This carousel in Metz boasts a balcony–fancy stuff! Truth be told, most Christmas markets have a similar feel. They are best suited to a day (or better yet, an evening) of meandering, nibbling, and sipping. The ambitious (or tipsy) among us may revel in the shopping experience, but it’s the general atmosphere that most of us go for. Frohe Fest (Happy Holidays!) and see you at the markets! 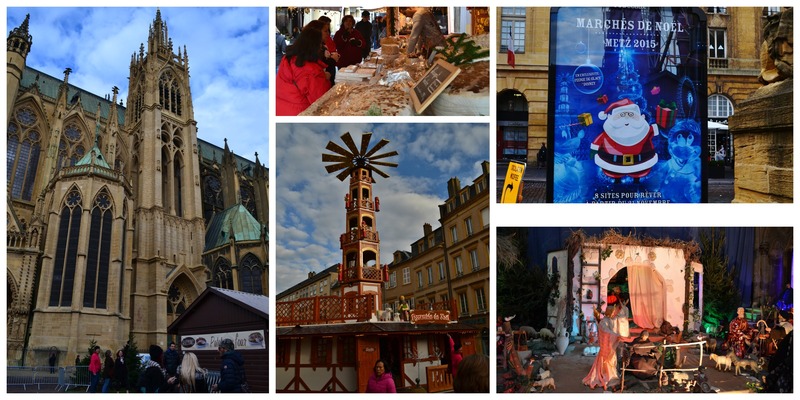 Yes–Christmas markets in Europe are the best! Thanks–the markets really are a great experience. Yes–they are so much fun to wander through. Thanks.